The challenging South West Ridge of Cholatse is a hidden gem of the Himalaya and a solid mountaineering objective for experienced climbers. Nestled between the Khumbu and Gokyo Valleys in Nepal's Everest region, Cholatse is a spectacular peak with steep soaring lines on every aspect. Our expedition acclimatises first on Lobuche East, before moving to the challenging alpine style climb of Cholatse. Our line up the South West Ridge involves climbing steep snow and ice pitches linking two camps that we place alpine style on our way to the summit. We acclimatise on Lobuche East before crossing the Cho La to our Base Camp beneath the mountain. The route ascends through snow slopes leading to a crux section on rock. Once past the difficulties, the climbing culminates in a steep and superb ridgeline that plateaus onto the summit dome. A deposit of US$1,000 is payable to secure a place on the expedition. The Expedition Trip Notes provide detailed information and background for Adventure Consultants' Cholatse Expedition. For the Cholatse Expedition we will take a minimum size of 6 people, and a maximum of 8 people hence spaces are limited. With 8 people there will be two Adventure Consultants guides and 3 or 4 Climbing Sherpas. The expedition leader will be scheduled approximately six months out from the trip start. All of our trip leaders have extensive experience at high altitude and a proven record of safety, success and compatibility. The number of guides is determined by the team size but the normal ratio of guides to members is 1:4. You will find our Guides companionable and strong expedition members with considerable power and willingness to see you achieve your goals. We have the luxury of a strong Sherpa team that will carry the team equipment, food and ropes on the mountain. There may be times where you contribute to the task of pushing the route forward and this may involve step plugging, rope carrying and assisting with some of the loads where necessary. However, we’ve ensured we have a strong team to fix the route and establish camps so you do not get overly tired from the route preparation and get a good chance to reach the summit. It will really help to ensure you are not overloaded and think hard about what is necessary to include in your personal kit as you are expected to carry your own gear. When you put all your gear into a pack it still amounts to between 18-25kg so the load is not insignificant and you must come prepared for the high level of physical output. This reinforces the need to take just the right amount of equipment with you on the mountain and to ensure you are ‘pack fit’ before you arrive on the expedition. See our Fitness Training Programs for information on how we can help you prepare for the expedition. Food will be of the highest standard possible, given the remoteness of the situation. Please inform us if you have any special dietary requirements. In the Khumbu Valley we will be dining in Lodges and at Base Camps we will be eating in the dining tent and cooked for by our expedition cook and support crew. Our camp equipment and ample, nutritious meals are always the envy of other groups along the way! We do recommend that you bring some of your favourite snacks like muesli bars, chocolate and/or candy as well as energy gels and electrolyte drinks that you are used to using. 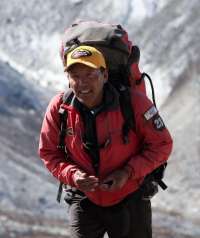 Expedition team members will be sent a list detailing all necessary clothing and equipment to be individually provided. Our 32-day Cholatse expedition commences in Kathmandu and on Day 3 we fly to Lukla, the gateway to the Khumbu valley. The expedition team will stay at Sherpa lodges whilst we are trekking in the valleys on the way to each of the climbing objectives. On each of the mountains we will establish a Base Camp where our kitchen crew will cater for us. In our mountain camps members will cook their own food, which we will import from New Zealand to ensure the usual high standard of fare to which you will be accustomed on our expeditions. After arriving at Lobuche Base Camp we will rest and prepare loads and meals for the mountain, plus revise some rope fixing and fixed rope safety. We will then move up to a high camp on Lobuche East on a small expanse of grass and rock above a deep blue lake. Then it’s early to bed for an alpine start the following morning. Our early start (around 2.30am) sees us climbing the South East Ridge which is a mixture of snow and ice. Where necessary, we fix ropes along the route. Steady climbing will bring us to the far eastern summit. From the top we are well rewarded with superb views across to Ama Dablam, Makalu, Lhotse, Everest, Nuptse, Changtse (in Tibet) Pumori, Gyachung Kang, Cho Oyu and of course Cholatse. Then it’s time for our descent, all the way back to our Base Camp. After the ascent of Lobuche East we program a rest day, then climb up and over the Cho La Pass and descend to Cholatse Base Camp. One of the guides and two Sherpas will have come directly here and set things up for your arrival. They will have also climbed to Camp 1 to get established on the route. After a rest day (if needed), members will carry loads up to Camp 1 and assist with establishing Camp 2. The climbing will be steep mixed climbing. Once Camp 2 is established we'll have a rest day at either Camp 1 or Camp 2. We will work as a team (members, guides and Sherpas) to establish fixed ropes above Camp 2 to the start of the summit ridge. Summit day will start very early, arriving at the top of the fixed ropes at dawn. We will then pitch and fix the low angled, but exposed summit ridge. This will be difficult terrain that is known to have sometimes variable conditions. The summit day will require maximum fortitude and the entire team will be contributing to the outcome with commensurate rewards! We will retrieve our ropes on the descent, arriving back at Camp 2 late in the evening. The next day we’ll return to Base Camp, removing all our equipment from the mountain. After Cholatse the expedition returns down-valley to Namche Bazaar, where we languish in the comfort of the lodges and the next day it’s onwards to Lukla for the flight back to Kathmandu.